Hello, friends! Hope your week is off to a great start! As I mentioned in my last post on my new kitchen wall sconces, I’ve been finalizing decisions and basically just waiting for my one new cabinet to arrive which will signal the actual beginning of my kitchen ideas coming to life! YAHOO! So basically, I’m waiting. Not a fan of waiting, but it will be worth it, right? Why can’t we just wrinkle our nose and our kitchen could be done? I am trying to keep you in the loop on decisions so you can follow along, but in case you are just jumping on board or missed my posts (here is the kitchen project category with all the posts, so far), let’s review now that you can see my inspiration board! WHOO HOO! It always helps to visualize, doesn’t it? I highly recommend if you are doing a room makeover to pull all your ideas together into one design board! There are lots of ways to make an inspiration board, but this one was made in Polyvore. Before we talk about the individual elements, remember that my floors are the existing hickory wood floors similar to what you see in the inspiration board. Since I was not changing the floors, they were the primary pattern and non-negotiable item in the room. Do you ever think about your floors being one of the patterns in your room? The pattern or grain in floors or countertops is often referred to as “movement” and mine have a lot of that! My wood has a distinct grain so that really helps define and narrow down the other choices I am making. Plus, the floors are a beautiful light color with deeper brownish grain. The wood color itself was something I had to take into consideration as well. In my old house I had beautiful wood counters, but tiled floors. 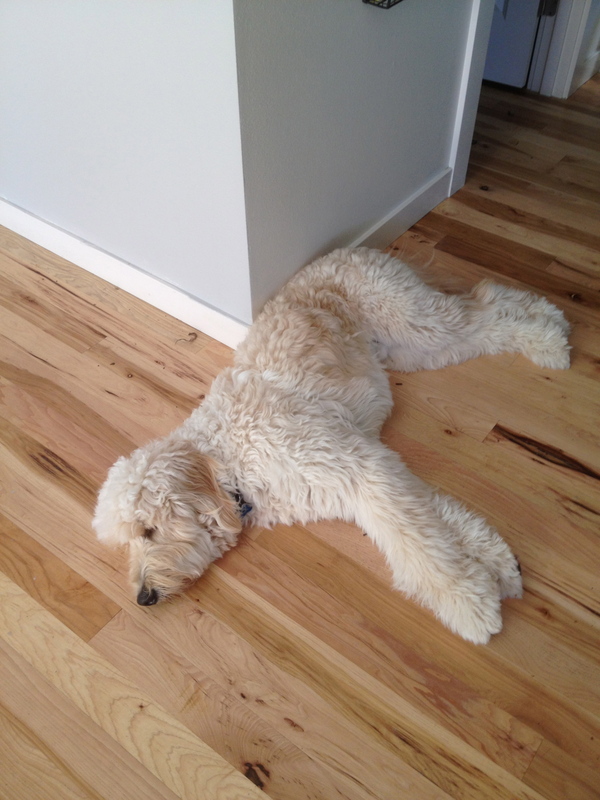 I chose the wood because I wanted to balance out the hardness of the existing tile floor. In this house, most of the natural wood will be focused on the floors, although I may add an island with wood top but that is all still to be determined (and budgeted for, ha!). More on how the floors impacted choices in a future post. As I talked about here, I decided on subway tile for my walls. Not only was it a pretty economical tile, I consider them classic in style. I could get fancy with the wall tile (glass, or choosing a color or distinct pattern) and end up tiring of them later, so I decided simple white subway tile will always be fresh and pretty. Since I’ve liked it for as long as I can remember, I think the risk of tiring of them is pretty minimal. The upper cabinets (which are above my baking counter and refrigerator, you can see it in the photo above) will be white and the lower will be the brownish grayish color still to be determined. The subway tile will go all the way up as a backsplash and around the wall in the whole kitchen area as well. I shared details on my sink and faucet here. The sink is a bit more modern styled traditional apron front sink and my faucet is the same style (just a different brand) as the one I had in my last kitchen. For this kitchen I’m going with a bit more modern but still traditional design. My ventilation hood will be similar to my old kitchen (above), just a little bit smaller scale. I will share more details on the exact hood in a future post. The hood is the only new “appliance” I’ll be getting for this kitchen, the existing dishwasher and stove will remain. I loved getting new appliances in my old kitchen, but the budget doesn’t allow for a new stove or fridge right now. Sadness. And yes, in my inspiration board you will see colorful Anthropologie dishes to spice things up, and a cool little coffee brewer kind of like mine. I’m hoping to sneak in an open shelf for the Anthro dishes to the right of the sink, above the dishwasher. I’m planning a new coffee station on the counter to the right of the sink to free up my baking area with more counter space! Speaking of counters, what did I decide on? Ah, don’t want to keep you hanging, but I’ll have to share all the details in my next kitchen update post because right now we are heading out to dinner. One of the inconveniences or joys of having your kitchen torn apart, depending on how you look at it! I will tell you that they are shades of white and I am SUPER excited about that, more details to come! So can you picture it so far? Can’t wait to see it all together! It sounds like it will be really beautiful. I think white is so classy and chic in kitchens. So excited for your two toned cabinets! I think it will be beautiful when it is all done. I would have bet money though that part of your cabinets would have been painted a brave color (like yellow). That might not have worked with your wood flooring though. Love the Anthro dishes for some added pattern. Yep. You nailed it, no yellow cabinets because of my floors. I really wanted contrast and yellow was just too much like the floors. Oh well. But don’t rule out something fun on my island ;-) … everything is still up in the air so you never know where some yellow might pop up. Looking forward to see how this project goes in the next few days! A coffee station … can I pop over? wonderful inspiration board..I didn’t know you could do that at polyvore..might make myself one…we too are planning an overhaul of our main level – I am thinking of using rustoleum cabinet transformations to give my honey oak cabinets a new look…not sure if we will go darker or white…cant wait to see what you’ve chosen for the countertops…as always love your blog! As I was looking at the first photos where you spoke about the colorations of the floor, I looked at the cabinets and thought….she’s painting the bottom ones for sure! Ha! And wouldn’t you know…a few sentences later you revealed it!! :D I love what you’re doing. Now if I could just figure out what I am doing…..
That is always the hard part, figuring out what one is doing. :-) Thanks Diane. Love it Melissa! I know you will be happy when it is all finished too! Like most of your kitchen ideas, however, I HATE STAINLESS STEEL ANYTHING ! It makes it look too institutionalized and COLD !!! Not to mention they are a mess to keep clean… require constant polishing and retouching… fingerprints on everything show up and look horrible. If you removed the stainless steel I would love the ideas. It seems in vogue today and for the past couple of years, but for someone who seems to take bold color choices in other areas… there are companies like Elmira Stove Works that have retro-colored items that look as if they are from the past but work with today’s gas and electric systems. Also, white, beige and black in some combination are timeless. I just would never pick something that adds sooooo much extra work to my life. I sold appliances for several years and the best color is beige with maybe black trim. The beige shows the least dirt. 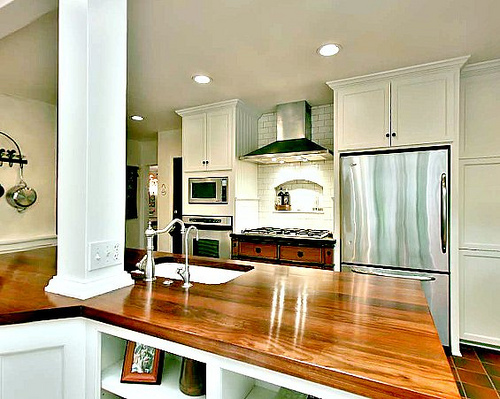 White is white and looks good with anything… practical and only boring if you don’t “accessorize” the kitchen properly. 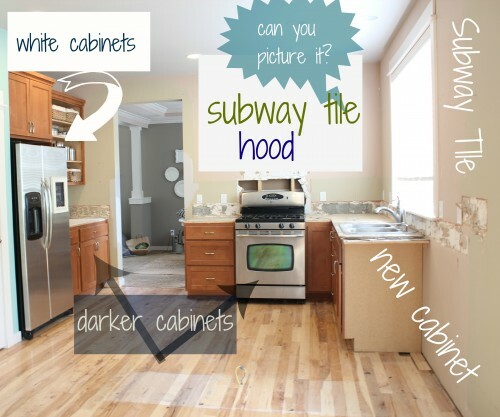 I also don’t understand why you would want to do darker with the cabinetry in the kitchen if you are doing the white subway tile… it would make one or the other or both look dirty. Just a simple fact learned from having helped people put together millions of kitchens. The faucet you have chosen, while it looks convenient at all angles, is one that will leak early on in live and wear out much more quickly than a simpler one. You can choose a deeper sink and a higher faucet, without all the twists and turns and areas for washers and leakage. Most of the time your rooms look light and airy and peaceful. This looks like a lot of extra work for not much reward. Over years of watching people make similar choices and then come back and tell me that they wished they had listened to me as they either re-gut their kitchen or have to live for years with something they now hate… I just felt like I should say what I felt about it. There are so many pretty and practical choices out there. I guess I’m living on the wild side with my stainless hood to match my existing stainless appliances and my darker cabinets and my curvy faucet…. but I’ll be smiling and my heart will be happy every time I walk through my kitchen! There are always decisions in a remodel or redesign that you have to make in regards to budget, to complement other elements in the room and adjoining rooms and to fit with your personal style. While they may not make sense to someone else, I’ve thought through what works for us and how we live, and I’m very excited about the decisions so far! I love a good kitchen remodel and can’t wait to see your finished product! I love those mugs in your inspiration board. Where are they from? Anthropologie! I love that you can add so much fun and personality through something as simple as a mug! I love white subway tile and I can’t wait to see it all done. I’m sure it’s going to be beautiful. You and I seem to have the same vision for our kitchen renos with a couple of exceptions – tile floor and more brown than gray for the lower cabinets. Can’t wait to see your results!! There are so many ways to do it, this was done in Polyvore online. Love all your ideas and particularly the two tone cabinets with the dark below. Should be stunning with the subway tiles. It would be fun to do something funky with the island. Hmmm… how about a splash of red? I think your present appliances will look lovely with everything – I have had stainless steel in both of my present kitchens (one in the city and one in the island cottage) and love them- easy peasy to keep clean and nice looking too. Yes, who knows what I’ll do with the island. I love that it is a separate project (freestanding) and I can dream it up as I go! :-) Red would be fun! I love you ideas! Can’t wait to see it as it progresses! We built our house four years ago, using subway tile in kitchen and bath. You won’t be sorry. It’s classic, and you never tire of it. I went for high contrasts….dark floors, white cabinets, white tile. Then you an add whatever color you want, wherever you want with the easy to change things like paint, fabric, accessories. You seem to have thought through your decisions am I am sure you will be pleased with the final result. I think it looks terrific so far! I love that pop of Anthro color you have planned so far! It’s going to be gorgeous! Thanks :-) I am excited to have the shell of the kitchen planned so I can move on to all the fun details of color in dishes and accessories! I love your floor, what kind of wood? Hi Sandra, the floor is Hickory! I love it! So happy for another little taste of things to come….is your free standing island going to run lengthways (in the same direction as the floor boards)? 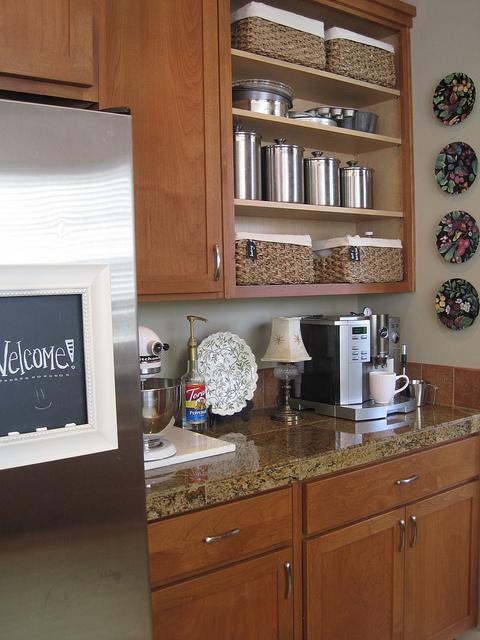 I love the handles – glass ones on the top doors and old fashioned handles on the darker base cabinets? Can’t wait to see how you design the cupboard next to the sink…Thanks for the update, I really enjoy your site! It is so much fun to watch your kitchen unfold. It is going to be awesome. You had so many decisions to make. Can’t wait to see how the cabinets and countertops look. Just wondering how you decided on Hickory for your floors. Do you have it in other areas of your house? (I’m getting hardwoods and gathering info.) Thanks and best wishes. 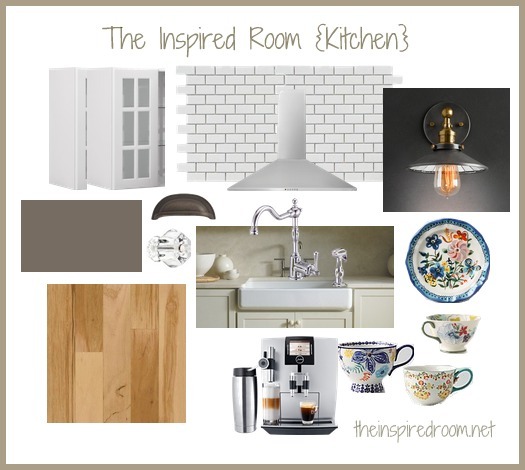 The inspiration photos are great :) can’t wait to see what the kitchen will look like! EXCITING!! I am LOVING these kitchen updates…seriously, I am having way too much fun. ;-) Can’t wait for more — it is coming together so perfectly! I have this exact same layout in my kitchen and not only do I wan to remove the extra cabinets that you did but also the wall (the oven wall) so it will be a totally open kitchen with one wall and an island in the middle, I can’t wait to see the finished product and I think this was the perfect time to do it, summer when kids are home and before holidays. Eagerly waiting for your next surprise . . . I know I posted once before about the dishes on the wall. Absolutely beautiful. such a classy and fun look! I too am waiting to see how it will all turn out. Have fun! Melissa, it’s going to be beautiful when it all comes together! I can’t wait to see the darker lower cabinets. Can’t wait to see the different parts and how you add your own family’s personality to this space, like you’ve done with the rest of your lovely home! Thank you! :-) I’m getting pretty excited to see how things turn out, too!